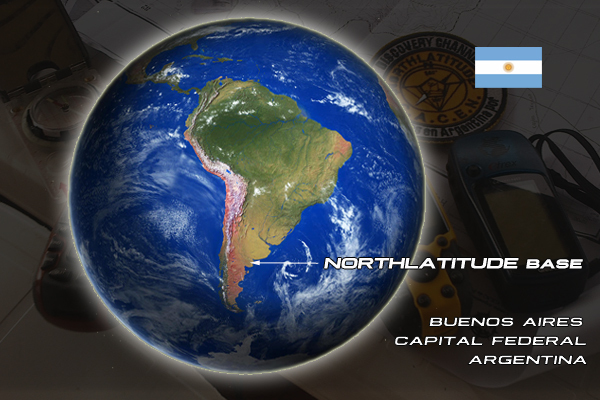 The classroom of our NORTHLATITUDE (C.A.C.E.N.) 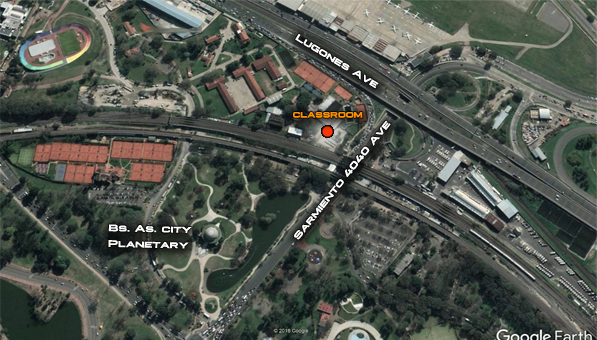 Center where we teach the Survival, Orientation, Multiadventure course and others, is located in Palermo, Capital Federal, Buenos Aires, Argentina, it is a block away from the Buenos Aires Planetary of the Buenos Aires city, in direction to the River of the Plata and the Metropolitan Aeroparque. Car. From the Capital Federal, Retiro neighborhood, you can reach us by the Figueroa Alcorta Avenue, from the Italia Square by Sarmiento Avenue on in opposite direction, by the same Sarmiento avenue from the Metropolitan Aeroparque , River of the Plata. You can also take the Lugones Avenue in direction to Sarmiento Avenue and just when you take the Sarmiento Avenue you can see the entrance to the parking car. Bus. You can also reach through the lines 67 from Constitucion, 9 de Julio Avenue and Libertador or the bus 130 from the Retiro neighborhood. Subway. Line "D" and descend in the Palermo or Plaza Italia station where from there you can reach us by walking 15 blocks or by taxi. Car. Capital Federal. You must take the Ricchieri freeway which heads right to the International Airport of Ezeiza and after a few minutes’ drive, cross over the “Puente 12” (bridge) over the Camino de Cintura (Route 4) and then, follow around 15 kms. more until getting near of another and last bridge named as “El Trebol” where 200 before crossing it underneath you must turn right and take a street which border the Asociacion de Futbol Argentina (AFA) -Argentine Association Football League- until reaching a route which comes directly from the aforementioned bridge. Once you reach it, turn right and you will find the entrance of the AFA abour 150 meters ahead which is the meeting point. As a reference, in front of its entrance you can see on the other side of the route the Instituto the Formación Ezeiza (I.F.E) –Institute of Ezeiza Formation- which depends on the Argentine Air Force. Zona Oeste (Western side). 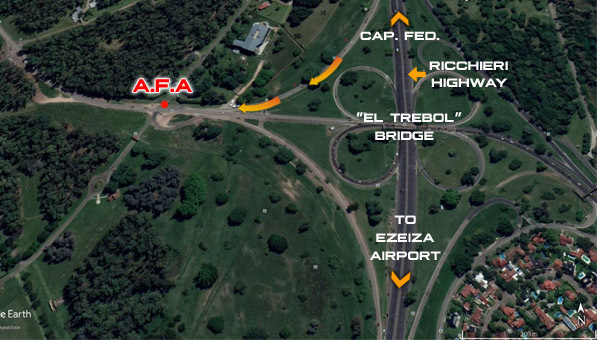 You can take the Ricchieri freeway from both sides of the Camino de Cintura, ever heading to the Ezeiza Airport, which leads you to the A.F.A., aforementioned meeting point. Zona Sur. Tomando la ruta nacional 205 procedente de las ciudades de Lobos, Cañuelas u otras, se llega directamente hacia el Puente "El Trebol", el cual se lo debe cruzar y seguir derecho donde a unos 300 mts. aproximadamente se encuentra el ingreso de la A.F.A. Bus. Capital Federal. From the intersection of the Independencia and Paseo Colon avenues, you must take the bus number 8 -ex 86-, only the one with a red sign which says "Aeropuerto Ezeiza (Ezeiza Airport)". From there, it takes the extensive Rivadavia Avenue until reaching the Liniers city where it will turn left to follow on the General Paz avenue, then, reach the Ricchieri freeway and from there, right to Ezeiza. Car. You can travel from the Escobar city. Bus. You can travel from the Escobar city. Taxi. 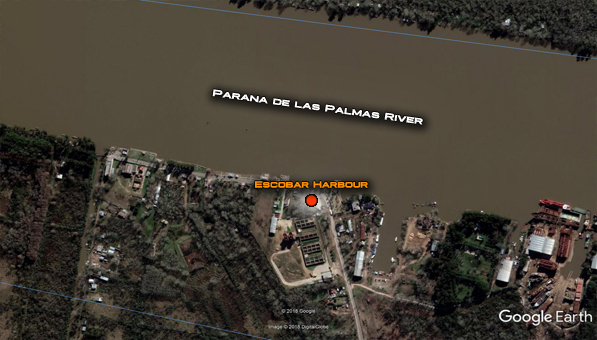 You can travel from the Escobar city.